We offer our guests four beautiful, air-conditioned suites all with scenic views. Each suite boasts a comfortable queen sized bed and private, fully appointed bathroom. Our guests will enjoy swapping travelling experiences and lively conversation with other guests in the cozy Traveler’s Lounge. Relaxing with a glass of wine on the Sunset Patio appreciating the beautiful sunset is a great way to end the day. In the morning enjoy a gourmet breakfast served by Ron and Darlene. Okanagan fruit, home made jam, fresh breads, scones, muffins and croissants accompany a savory hot breakfast and plenty of coffee and tea. As you relax over coffee your hosts will provide information on what to see and do in fun filled Osoyoos and the beautiful Okanagan Valley. Each room supplies you with toiletries, hair dryer, sitting area to enjoy the view from your room. In the Traveler’s Loung you will find, tea, coffee, water and soft drinks. A small library includes pamphlets on what to see and do in Osoyoos. The property is non smoking and unfortunately we are unable to accommodate pets. and a view of Osoyoos Lake, Orchards, and Vineyards. Adorned with Northern Canadian décor, relax in a queen sized bed, plus a single bed, all made with beautiful linens. 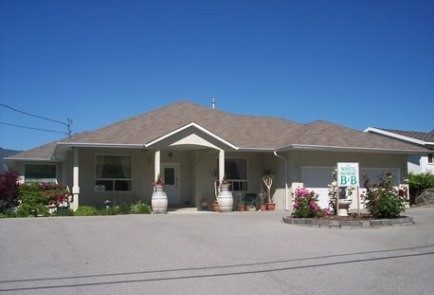 Enjoy the panoramic view of the vineyards and Osoyoos Lake. The Northern Room has a private en-suite. After your busy day golfing, sightseeing, touring wineries or playing at the beach, enjoy an evening on the Sunset Patio or in the Traveler’s Lounge. Adorned with local Wine décor, relax in a queen sized bed, made with beautiful linens. 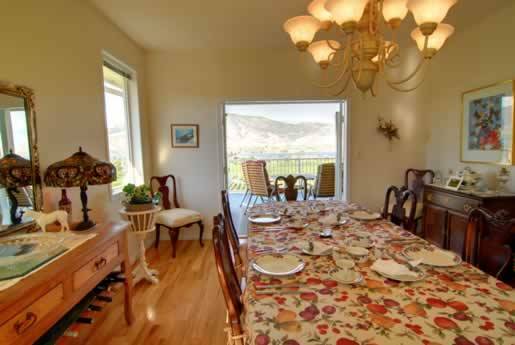 Enjoy the panoramic view of the vineyards and Osoyoos Lake. The Wine Room has a private en-suite. Adorned with Canadian prairie décor, relax in a queen sized, four poster bed, made with beautiful linens. 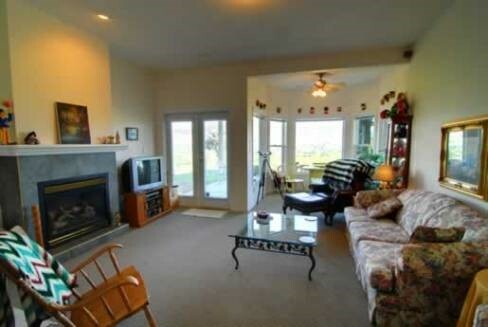 Enjoy the panoramic view of the vineyards and Osoyoos Lake. The Prairie Room has a private en-suite. The Poppy Room is located on the main floor and is wheelchair accessible. Relax in a Queen bed, made with beautiful linens.